Bus from Johor Bahru to Mersing is an alternative and cheaper option as well as a backup option for Singapore residents who wish to travel to Mersing and then Tioman Island. Of course, the bus from Johor Bahru to Mersing does also serve the locals who travel between the two cities. S&S International, Causeway Link, Plusliner, Maraliner, and Transnasional are the reliable coach companies providing bus from Johor Bahru to Mersing. With a total of 14 daily departures, travellers can choose the schedule that best fit their convenience. The journey duration is about 2 hours. The bus fare for bus from Johor Bahru to Mersing is in the range of RM 12.70 – RM 17.60. 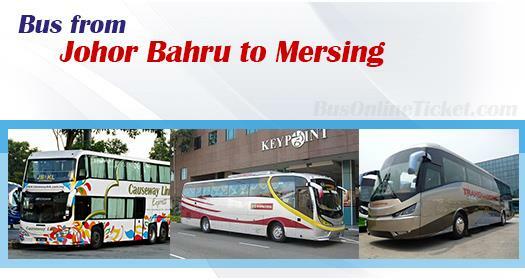 Because of the much cheaper bus fare in Johor Bahru, some budget backpacker will take the bus from Johor Bahru to Mersing instead of taking bus from Singapore to Mersing. The earliest departure is at 7:25am, while the last departure is at 11:00pm. Another group of travellers may choose to take a bus from Johor Bahru to Mersing because the ticket for bus from Singapore to Mersing is sold out. They have no choice but to take the alternative option from Johor Bahru to Mersing. The departure point for all the coaches going to Mersing in Johor Bahru is at Larkin Bus Terminal. Their arrival point is at Mersing Bus Terminal, which is 10 minutes walking distance from Mersing Jetty. Those who continue the journey to Tioman Island by ferry can easily walk to the jetty to catch the ferry to Tioman Island. In Larkin Bus Terminal in Johor Bahru, there are many agents who may try to sell you bus tickets which are without clear departure time. The best way to avoid them is to tell them politely that you have purchase Johor Bahru to Mersing bus ticket in advance via online. They will not continue to disturb you. Hence, booking your Johor Bahru to Mersing bus ticket online at BusOnlineTicket.com is not just hassle-free, but also helps you to avoid those agents in Larkin bus terminal politely.